Trump Caved to North Korea Again, and That's Both Good And Bad. Here's Why. Since taking office, President Donald Trump has repeatedly complained about the large-scale exercises, saying they’re too costly and the U.S. bears too much of the financial burden. Every year, around the same time, the U.S. and South Korea do “joint military exercises” that basically cosplay an invasion of North Korea. It’s a demonstration of our joint military might, and every year, around the same time, North Korea does something provocative as well. In the United States, we only really get news on the latter, not the former, and the “oh my God North Korea can bomb California!” national news cycle is as reliable as Fox News’ “War on Christmas” annual news cycle. It’s not like there’s no reason to fear North Korea. They have nukes! Or something approximating them. It’s hard to tell. They don’t call it the Hermit Kingdom for nothing, but our understanding of their motivations is based on faulty logic. And this is where we get to the part where yes, Trump made a horrible deal given the leverage he held, but he scored an important victory for peace—whether he meant to or, more likely, whether it was a temper tantrum stemming from last night’s loss. What do 1940s South Korea, China and Greece, 1950s Iran, Guatemala, Laos, Indonesia, Lebanon, Iraq, 1960s Democratic Republic of Congo, Laos, Dominican Republic, Cuba, Brazil, Iraq, Vietnam, Dominican Republic (again), Indonesia (again), Greece (again), 1970s Bolivia, Iraq (again), Chile, 1980s Afghanistan, Poland, El Salvador, Nicaragua, Grenada, Panama, 1990s Kuwait, Haiti, Iraq (again), 2000s Yugoslavia, Iraq (again), Palestine, Syria, and 2010s Libya, Egypt and Yemen have in common? None of those U.S.-backed overthrown regimes had nuclear weapons. We tried amplifying the popular protests earlier this century against nuclear-curious Iran and that regime is still standing. The United States has proven beyond a shadow of a doubt that the only way to avoid the inevitability of regime change in the nuclear era is to either fall in line with U.S. foreign policy, be unimportant to U.S. foreign policy, or own nuclear weapons. Our conception of North Korea is wrong, and it’s due mostly due to the elite political and media hysteric consensus that this is a suicidal regime hellbent on our destruction. Sure, that’s the propaganda they put out, and the North Korean regime undoubtedly centers much of its propaganda around standing up to our empire, but it’s propaganda that has a nugget of a point. Kim Jong-un and his ruling regime are not some reckless group of tyrants hellbent on destroying the world in a nuclear inferno (but they are reckless tyrants). This is one of the oldest ruling regimes on the planet. They know what they’re doing. North Korea is the last modern connection left to the Japanese imperialist authoritarianism that dominated that region during World War II. They want us to think that they are their hyperbolic rhetoric as a way of both shoring up their support at home, and as a negotiating tactic because everyone knows that they hold their finger above the “worst-case scenario” button. They’re not the unhinged psychopaths they project themselves to be. They’re rational actors just like we are. Just like South Korea, and the 78% of South Korean citizens who support these efforts to make peace in the region. The United States is part of the problem. North Korea is relatively untouchable for two reasons. First, they can level Seoul (a city with a million more people than New York City) with conventional weapons in the span of an hour. Second, China. The former is a reality that will never go unchanged, while with the latter we have some amount of control. It’s not a great situation for China to have a nuclear-armed tyrant stirring up tensions on its southern border, but it’s a better situation than the United States having thousands of troops perpetually stationed just across the Chinese border. North Korea exists in this current iteration in part due to the United States’ presence in the region. If the U.S. decreased its military presence in the region, China would feel less threatened, changing their calculus on Kim Jong-un. Trade with China represents a little more than half of North Korea’s economy. If the Chinese wanted Kim Jong-un gone, they could do it in a month. His value to them lies largely in being a hedge against the U.S. history of military and CIA operations against adversarial regimes, but if the U.S. lessened its aggressive posture, China would view the Americans as less of a threat in kind (I’m not advocating a full-retreat from the region here—providing increasingly authoritarian China with that kind of vacuum to step into would be a betrayal to our allies in Japan and South Korea, and likely more disastrous than failing to nullify a key piece of North Korean leverage). Theoretically, the goal should be to create a situation where China views Kim Jong-un as more of a nuisance than a buffer, hopefully leading to a consensus among regional powers that with this genocidal North Korean regime, regime change is necessary, even if the United States and its sordid history is involved. The situation with North Korea is incredibly complex, and the U.S. is not the primary consideration here. South Korea, China and Japan are the regional powers most immediately threatened by a bellicose North Korea, and America’s role in all this is clouded by our vast history of regime change. Supporting the ongoing provocations (“military exercises” is literally repeating the state line) means undermining the peace efforts that an overwhelming majority of South Koreans—our staunch allies—want. I can’t believe I’m saying this, but Donald Trump—whether intentionally or not—has honestly done as much to forge peace in that region as any president in this millennial’s lifetime. 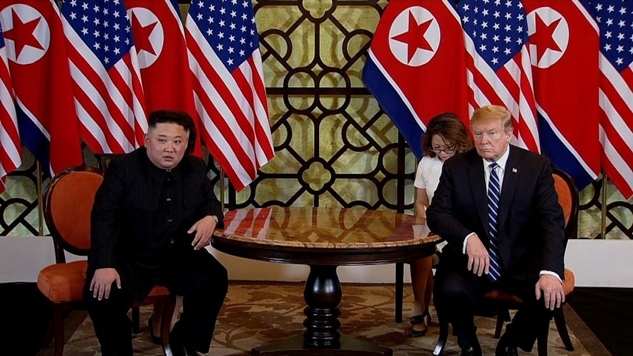 This was a bad deal because there really was no deal and North Korea got yet another tangible and propagandistic victory over America, but de-escalating tensions is not “nothing.” Ultimately, it’s everything.